Dimensions variable, 2 colour video projections, 5.1 channel surround sound, 2011-2012. "Polina Zioga - The Shelter", Fournos Center for Digital Culture, 18-26 June 2012, Athens, Greece. to which is tightly and proportionately linked." 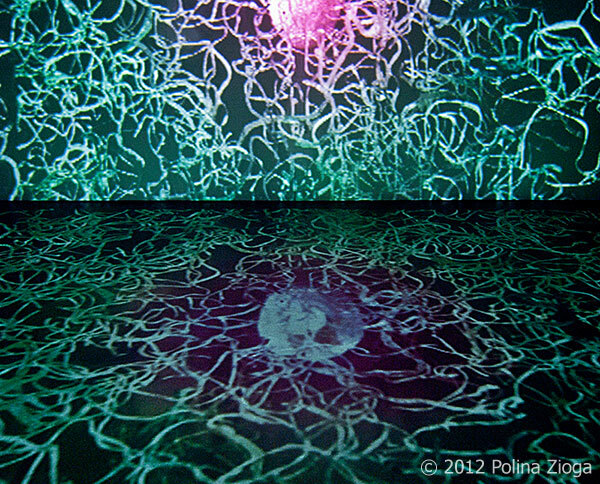 An internal environment is being created with two video projections. The vertical shows a web of pulsating human vessels, created by scanned, edited and animated prints of digital angiographies of my brain, performed with the injection of a radio-opaque contrast agent. This web frames, feeds and protects a central core, a cocoon with a human figure inside, an allegory for the human soul. At the same time more elements have been inserted, such as artificial moths in movement, which mislead us regarding its biological or physical dimension/aspect. The vertical video projection continues to the contiguous floor, as the natural/artificial landscape is reflected through the element of water, which creates a dreamy sense of movement. For the sound an ambient electronic score has been created. Recorded voices whisper Heraclitus’ verses, while the final audio is produced in surround mode, in order to create a sense of hearing the sounds and the voices coming out from all the corners of the space. "Everything is the body and this body belongs to everybody, as a common ground. The artist makes a careful incision into her body and while the movements which are conduced around us are leisurely, poetic, she invites us to enter into her personal room/shelter, she reveals its inside and she “donates” to us her organs. A new environment has been born from her innards. Seductive voices are surrounding us, from every corner of the room, pronouncing verses coming from a primeval and universal past. The installation functions as a rituals’ scenery for our induction into the sanctuary of the human body, where through the self-knowledge and the meticulous input, aspires the preservation of its autonomy but also its union with the nature, the final output." From Zoe Fragouloupoulou’s critical text "The Shelter". On the occasion of the exhibition, the bilingual publication "The Shelter", in Greek and in English, was released by Pavlidis Creative publications. You can order it here. 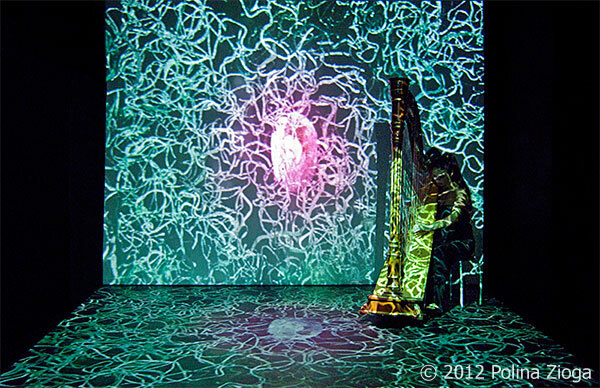 On 26 June 2012, last day of the exhibition, the harpist Maria-Christina presented a music performance with works of hers and George Dousis' for harp and electronics. Inside the internal environment of "The Shelter" the external allurement of this music instrument gives its place to an inner course of introspection towards the "Dark side of the Harp". The seductive voices of the video installation, who narrate Heraclitus’ text, fade away in order to give their place to sounds and music improvisations, connected with subconscious processes, hidden and dark thoughts. The dreamy sound of the electroacoustic harp inside the evocative environment of the video projections is mingled with music whispers and distant shouts with the help of bows, sound effects and electronics. 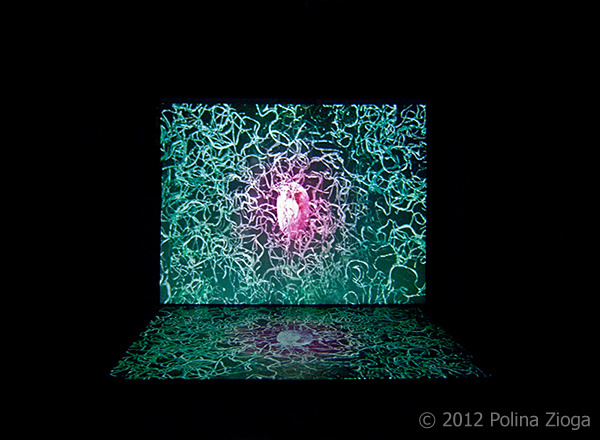 "The Shelter", video installation view, Fournos Center for Digital Culture, 18-26 June 2012. "The Shelter", video installation view (detail), Fournos Center for Digital Culture, 18-26 June 2012. "The Shelter", closing event: musical performance by the harpist Maria-Christina with works of hers and George Dousis' for harp and electronics, Fournos Center for Digital Culture, June 26 2012.